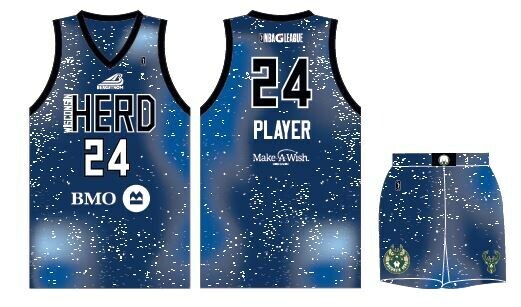 The Wisconsin Herd, the NBA G League affiliate of the Milwaukee Bucks, will wear Make-A-Wish® themed uniforms, presented by Bergstrom Automotive, on Wednesday, March 13. The special themed-jerseys, presented by Bergstrom Automotive, will be auctioned off at whmaw2019.afrogs.org. Fans can bid now through Sunday, March 17 at 12 p.m. with proceeds benefiting Make-A-Wish® Wisconsin. The Herd game will serve as an unofficial tipoff for Bergstrom’s annual Drive for Dreams. All Bergstrom dealerships will donate $5 to Make-A-Wish® Wisconsin for every test drive taken in April. Limited seats are still available to see these unique jerseys in action on March 13. To purchase tickets, go to wisconsinherd.com or call a Herd sales representative at (920) 233-HERD. Make-A-Wish® Wisconsin serves a unique, and vital, role in helping strengthen and empower children battling critical illnesses. Since the Wisconsin chapter was founded in 1984, more than 6,700 wish families have experienced the power of a wish come true. Last year alone, the chapter granted a record-breaking 402 wishes. It is predicted that 500 Wisconsin children will be diagnosed with a life-threatening medical condition this year! Wishes are game-changers for children, filling their lives with something positive and uplifting during dark and challenging times. For many, their wish marks a turning point in the fight against their illness! Thanks to our caring supporters, like Bergstrom Automotive and the Wisconsin Herd, hundreds of children will discover the power of a wish come true this year. Charlotte wishes to eat lunch with her favorite princesses. Charlie wishes to go to Australia. Max wishes for an adaptive play structure. Kelly wishes to go to Hawaii. Marcus, Gracie, Gabriela and many others wish to go to Walt Disney World® Resort. Together, we create life-changing wishes for local children with critical illnesses.